It is hardly an overstatement to say that the incredibly successful Muv-Luv kickstarter owed it entirely on just how much people adore Muv-Luv Alternative. Being the final act of a visual novel trilogy Muv-Luv Alternative firmly plays upon the expectations of its once lighthearted roots in the original Muv-Luv to present a far more mature sci-fi tale in which the stakes have never been higher. Does it provide an exciting, satisfying conclusion or will it leave the player traumatized by the end of the whole ordeal? ...That was a trick question, actually, because Muv-Luv Alternative has no shortage of excitement and trauma. 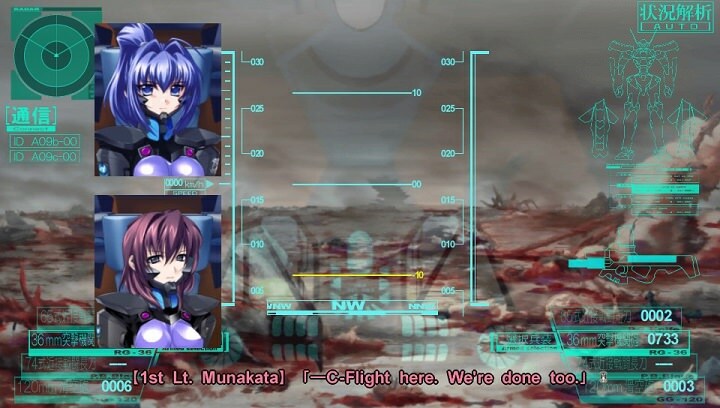 As the the trilogy finale Muv-Luv Alternative expects a strong familiarity of the original Muv-Luv because it takes nearly every route, character, and story element from them into account. Because of this, some amount of narrative spoilers of the previous titles are pretty much unavoidable when talking about Alternative to any serious degree even though there will be an effort to minimize them. With that disclaimer out of the way, Muv-Luv Alternative brings players back in the past, quite literally, as the lead character Takeru Shirogane's consciousness returns to an all too familiar October date yet again in a Groundhog Day fashion. After witnessing the end of mankind during its last ditch effort plan called "Alternative V" within Muv-Luv Unlimited's finale Takeru is now driven to do whatever it takes to steer mankind's chance at survival back on its course and prevent it from happening once again. With this pretense Alternative has the really intriguing setup of both the player and lead character being on the page regarding events of games past. As such, most of the in-game dialogue choices have the player/Takeru armed with the knowledge they should not have at this point, yet also the anxiety of the consequences when attempting to change too much to the point where he can not predict events going forward. It is by playing upon this expectation that the storytelling is quite willing to teach players that change may not necessarily be for the better. The previous title, Muv-Luv Unlimited, frequently tip-toed around its darker story elements yet rarely committed to anything to a frustrating degree. 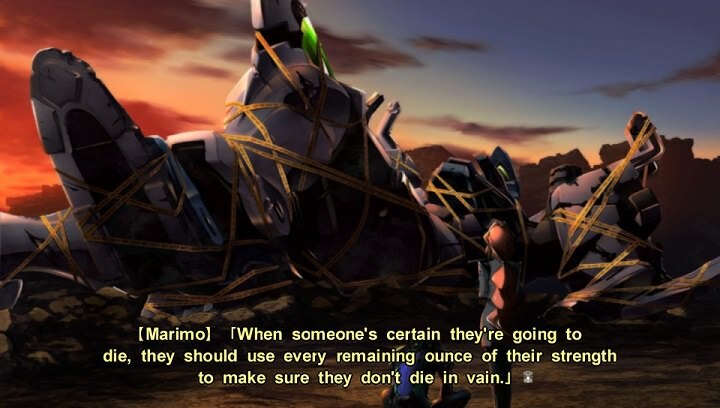 Muv-Luv Alternative, however, has an immense sense of foreboding throughout and one can not really overstate just how grim the narrative can shift at any time. For instance, there was certain gut punch sequence in particular that left me so disheartened that I literally could not play the game the following day. Not because I was not engaged I while playing it, but because of how effective the game was at delivering its narrative cruelty. Little did I know that I was not even halfway through the game yet and had so much more (gripping) heartbreak in store. To say that Muv-Luv Alternative is an emotional roller-coaster is putting it lightly, but there is certainly a slow introductory ramp before reaching those immense narratives highs. It is not exactly due to its deliberate Groundhog Day nature of seeing familiar events in a different light either but mostly because of how Takeru himself has a few too many redundant flashbacks and goofy anime antics that it makes the early narrative pacing move to a near crawl in addition to revisiting what should be familiar events. Plus, well, the game itself is massive for visual novel standards and will easily take fifty hours for slower readers to get through. So it is quite demanding to ask players to trudge noticeably less compelling initial story instances when it goes on for more than a few hours. But still, in spite of its pacing issues, Muv Luv Alternative wisely utilizes a lot of it to work towards some straight up expertly handled character development for its lead protagonist in particular. Frankly speaking, Takeru was rather obnoxious in the previous games (heck, the start of this game too) to the point it was difficult to believe that any woman would fall head over heels for him in games past and to see him evolve so thoroughly as a person in a very believable way is nothing short of impressive. The many key heroines do certainly have their time in the limelight as well too, of course, like the incredibly strong-willed Meiya to the fascinating yet also so very morally ambiguous scientist Yuuko, but few of them see nearly as much change as Takeru does during Alternative's tale. Going back to the main story, however, in addition to it being very emotionally charged it also far more complex from a world-building perspective than prior Muv-Luv titles.Themes that were vaguely touched upon in Unlimited this game more than delves into like from a political intrigue standpoint, to the inner-workings of their mech suits as well as battle tactics, and, for better or worse, the true horrors of war from both a human perspective and also a very not human one when the alien race called the BETA makes it abundantly clear why mankind is on the brink of extinction in this timeline. It is a highly involved grand finale and after seeing first hand just the lengths it goes to tell it there is no doubt in my mind it is regarded as a classic for a reason. It is easy to put an unreasonable level of expectations upon Muv-Luv Alternative. It demands so much out out of the player upfront with two basically mandatory visual novel predecessors, as well as to be able to put up with Alternative's own fairly plodding early goings from a time-commitment perspective to fully appreciate its massive narrative. But, that is just it, while there are most certainly a few glaring shortcomings Muv-Luv Alternative's narrative high points are incredibly high. Whether it be through the course of its grim but compelling sci-fi tale to its phenomenal lead character development it is easy to see why the fandom is so passionate towards this trilogy finale. 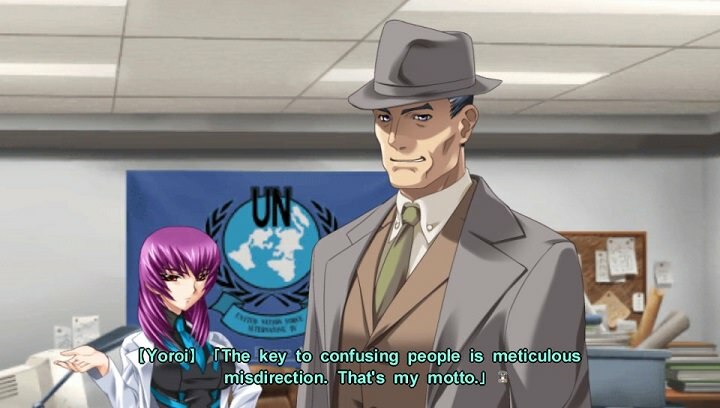 Those that are in-fact patient enough to go through the demanding legwork will likely confidently see why Muv-Luv Alternative earns its title as a classic among visual novels.